I don’t often wear makeup. But, when I do, I almost always grab for lipstick. Sometimes I just need to add a little bit of color to my face. Sometimes I just want to dress up a little extra for a special occasion. In doing some research on how best to choose a color (more on that another time), however, I unfortunately discovered that many of my favorite lipsticks contain lead. A quick search for lead-free lipsticks revealed that even many of the “natural” organic lipsticks contain titanium dioxide, which has been deemed by the International Agency for Research on Cancer to be a potential carcinogenic. Although titanium dioxide has been found to be most harmful when inhaled, and to not be absorbed through skin, I still don’t like the idea of potentially ingesting it. 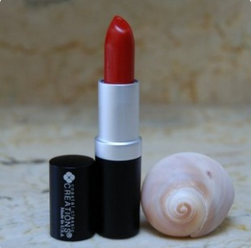 These lipsticks are made in the U.S.A. and are vegan, as well as gluten- and cruelty-free. 10% of sales go to supporting the non-profit NGO Zamibia Open Community Schools. Lipsticks come in 11 shades. Coastal Classic Creations prides itself on its responsible packaging. Like Au Naturale, they also offer products that are cruelty free, and donate a percentage of their proceeds to an array of health and human services, cultural, and environmental organizations. Lipsticks come in 6 shades. 100% Pure uses fruit pigments to dye their lipsticks, which are cruelty free. Like Coastal Classic Creations, they use responsible packaging, and donate to a wide range of organizations. Lipsticks come in 8 shades. How about you? Are you also concerned about the ingredients in cosmetics? What is your favorite lipstick? What Do You Wear to Sleep?